These pumps are suitable for handling clean water not containing abrasive particles, and fluids which are not chemically aggressive to the pump components. TO ABSOLUTELY GUARANTEE PRIMING OR PROTECT AGAINST DROPOUT. Cast iron PUMP BODY with UNI ISO 228/1 gas threaded suction and delivery ports. Aluminium back plate/ MOTOR BRACKET with brass insert (patented), reducing difficulties when starting the pump after long periods without use, due to the impeller sticking. BRASS IMPELLER, with radial blades. AISI 430F stainless steel MOTOR SHAFT (416 UP TO 0.37KW). 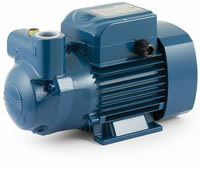 MOTOR: pumps are coupled directly to an asynchronous, high efficiency PEDROLLO induction motor of suitable size, which is quiet running, closed and externally ventilated, suitable for continuous duty. INSULATION class B. A thermal cut-out device (motor protector) is incorporated in single phase motors up to 1.5 kW. Model CK 50 is available with a bypass that limits maximum dynamic head to 20 meters.